Despite beginning his career with the less-than-glamorous moniker “Unnamed Rabbit,” Bugs Bunny has become the most popular character in the Looney Tunes universe and a cultural icon in his own right. Generations of children have gleefully witnessed his wacky antics in hundreds of animated shorts and even a full-length feature film or two. Here are ten lessons that these little ones might have absorbed while watching Bugs in action. Brains Over Brawn – In a confrontation, Bugs Bunny is usually the victor due to his quick wit and ability to think on his feet. In this era of bullying awareness, kids can take a page out of Bugs Bunny’s book by relying on their intelligence to beat a bully at their own game, instead of relying to physical retaliation. Friendships Can Be Complicated – Though the characters are portrayed as best friends now, there was once a blistering rivalry between Bugs and co-star Daffy Duck. There are still glimpses of that old tension from time to time; from watching these interactions, kids can learn that friends sometimes argue, but true friends will always make up. Attitude is Everything – During the difficult years of World War II, Bugs Bunny’s popularity skyrocketed, largely due to his easygoing, fun loving attitude. This optimism resonated with audiences, offering them a reprieve from their anxieties. Just like happy-go-lucky Bugs stole the hearts of moviegoers, kids who look on the bright side might find themselves to be a favorite among their peers. 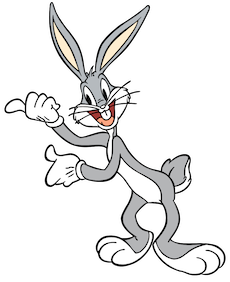 There Is No “I” in Team – Though Bugs is the indisputable favorite of Looney Tunes lovers, he’s aware of the fact that he owes much of his success to the rest of his ensemble. Watching Bugs Bunny interact with his co-stars to create entertainment gold can show children the value of teamwork. You Should Always Use Your Powers For Good – Bugs Bunny uses his popularity to benefit society by doing public service announcements and actively campaigning for drug prevention. Kids that watch Bugs use his status to affect the world positively can learn the importance of making a positive impact. Patriotism is a Virtue – Whether he was boosting morale and campaigning for the war effort of WWII or making an appearance on a stamp to celebrate the US Postal Service, Bugs Bunny has never shied away from showing his love for his home country. Smart Mouths Lead to Trouble – In many of the earlier Bugs Bunny shorts, his altercations with other characters stemmed from his smart-aleck tendencies. From watching the trouble that Bugs lands himself in by speaking first and thinking later, kids can glean the importance of watching what they say. Embrace Change – The earliest incarnations of Bugs Bunny were quite different from the iconic character we all know and love today. Through a series of changes, Bugs became the beloved character he is now; embracing change led to his growth and eventual success. Being Yourself Pays Off – With his indomitable spirit, Bugs became such a part of pop culture that he even earned his own spot on the Hollywood Walk of Fame. He shares the honor of first cartoon characters to be memorialized there with Disney star Mickey Mouse; for Bugs Bunny, being himself paid of in spades. Avoiding Conflict is Best – Though conflict is Bugs Bunny’s bread and butter, he often tries to smooth things over with his enemies. Retaliation is a last resort for Bugs; though it is inevitable, he tries his best to avoid conflict.